As Salem, Massachusetts approaches the 400th anniversary of its founding, the city is simultaneously being robbed of its 400 years of history. On December 6, 2017, Bob Monk, a representative of the Peabody Essex Museum (PEM) along with a member of the PEM’s architectural firm, Schwartz/Silver, confirmed what many Salemites had been fearing since 2011. The collections of the Phillips Library would not be returning to their home at 132 Essex Street. In 1992, The Peabody Essex Museum was created by a merger between Salem’s most prominent institutions, the Peabody Museum and the Essex Institute. 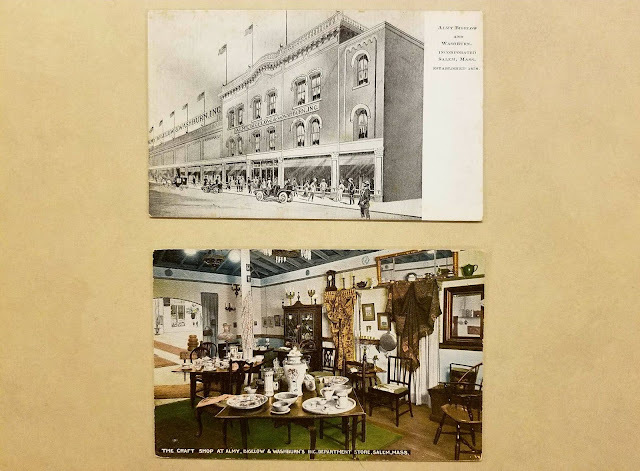 Both institutions were the stewards of four centuries worth of artifacts, documents, furniture, and even buildings, all of which contributed to the historic fabric of the city. Some of these objects were donated by Salem families and businesses, hoping to leave a legacy for the city’s future generations. While others were deposited by institutions that, at the time, didn’t have the funds or space to properly care for them. 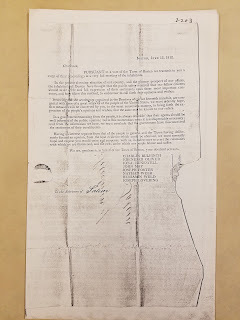 Items include: papers from Salem's founding, documents and artifacts relating to the Salem Witch Trials, log books from Salem’s “Great Age of Sail,” a signed first edition of Nathaniel Hawthorne’s The Scarlet Letter, and a deposited copy of the Massachusetts Bay Colony Charter. Not to mention volumes of manuscripts and family heirlooms donated over the years. 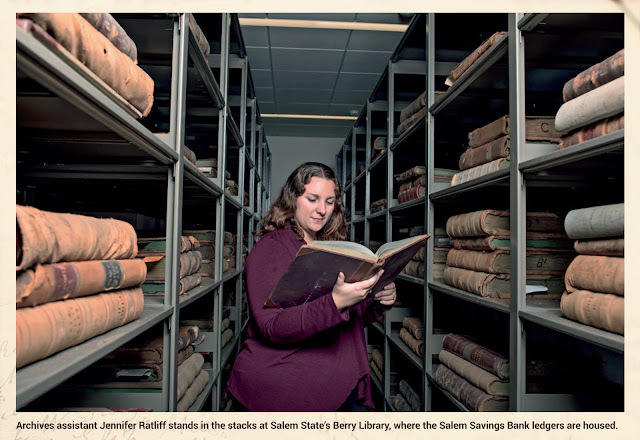 Not only is The Phillips Library “a part of what Salem is,” it in fact is the largest depository of Salem’s collective history, giving the Peabody Essex Museum a monopoly over the City’s past. As Salem struggles to define itself and its history to hundreds of thousands of visitors each year, it has become increasingly apparent that the collections of the PEM hold the key to the proper interpretation of the city’s historic past. A role that they have failed to uphold. The Peabody Essex Museum has instead spent the past decade, focused on branding itself as a leading art museum, and to that claim, it has been successful. But at what cost? The 2013 proposed completion date of the Phillips Library came and went with little-to-no new information announced by the PEM. In December 2016, The Peabody Essex Museum announced the addition of “40,000-square-foot wing” to be completed on the Museum’s main campus by 2019. 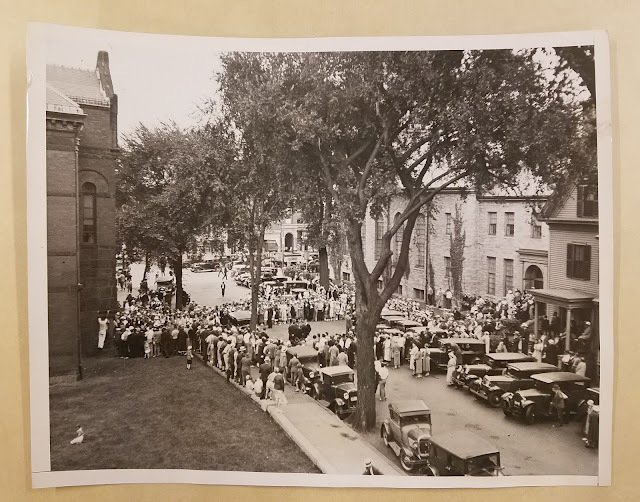 The silence surrounding the fate of the Phillips Library was broken on December 6, 2017 when Bob Monk announced to Salem’s Historical Commission that, as of 2018, the Phillips Library collections would permanently be housed in Rowley, Massachusetts, forty minutes outside of its Salem origin. 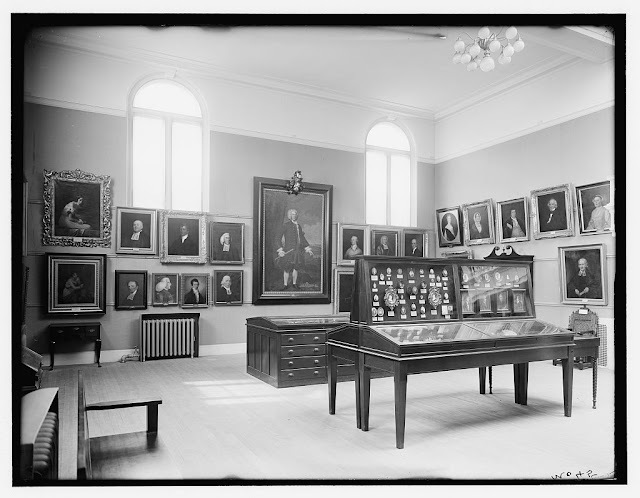 Monk claimed that the PEM was unable to find a suitable location in Salem for the return of its collections. 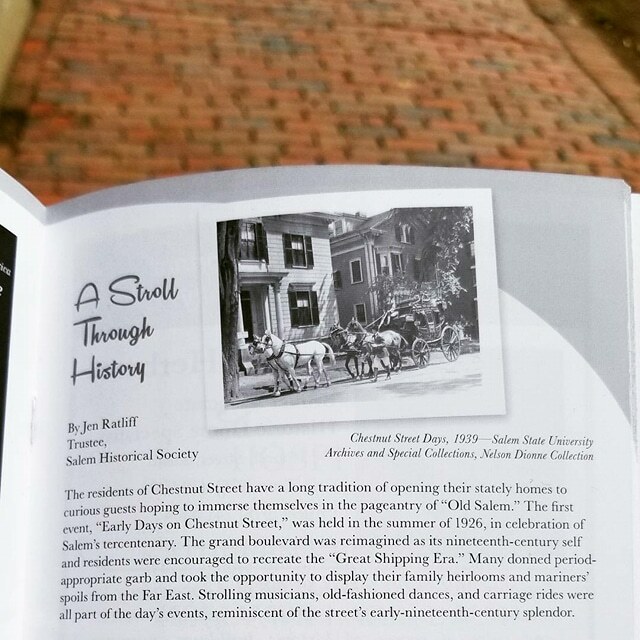 Not only was Salem to lose her 400 years of history to Rowley, but the beautiful brick, Plummer Hall and Daland House buildings, which previously housed the collections were to be desecrated as well, and closed to the public, for the sake of private office space to house the Museum’s staff. During the Historical Commission meeting, Schwartz/Silver (initially hired for the 2011 renovation) displayed mock-ups illustrating the destruction of the grand stairs and the connector, which first united the two buildings in 1907, as the home of The Essex Institute. 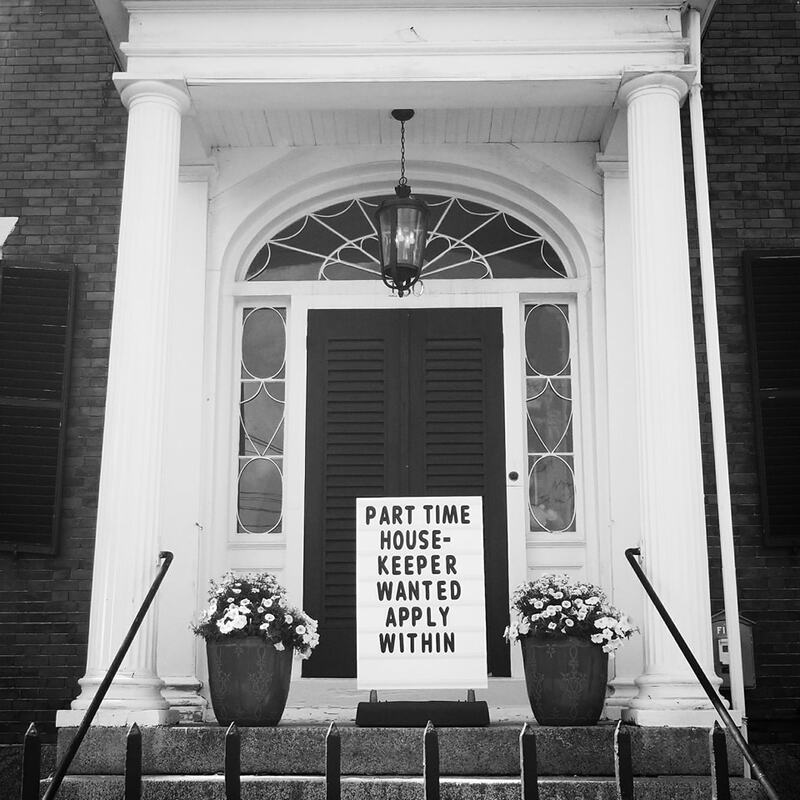 Just as the Peabody Essex Museum is severing Salem from its history, Schwartz/Silver are severing Plummer Hall from the Daland House. 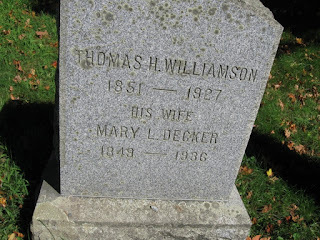 The crowning jewel of the PEM’s attack on Salem’s history? A modern glass encasement to replace the 110-year-old connector, to better match the Museum’s 40,000-square-foot new wing across the street. This is, however, not the first time the historic city has wrestled with the possibility of losing its history. 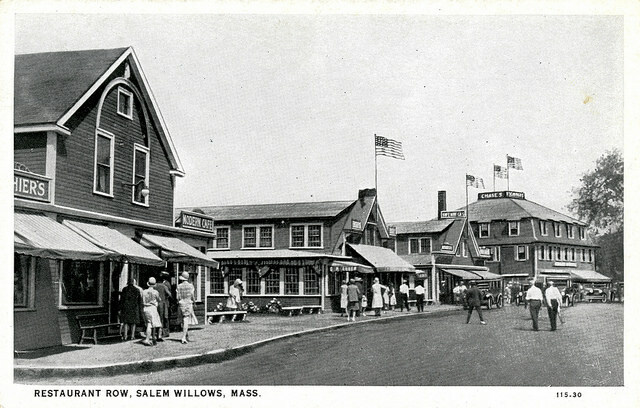 In 1965, at the pinnacle of Urban Renewal, Salem stood to replace its architectural heritage with highways and parking lots. By this plan, the site of the PEM’s new wing would have become part of a four-lane highway. 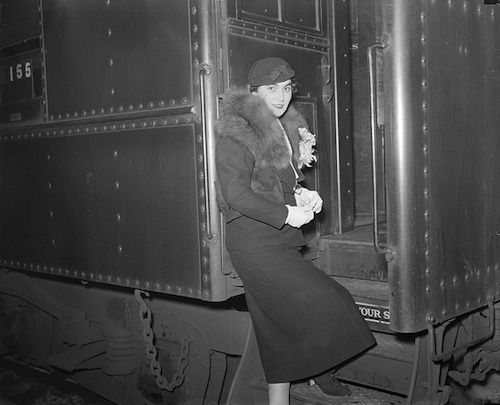 The New York Times architecture critic and preservationist Ada Louise Huxtable wrote a front-page article, credited with saving Salem, calling the proposed plan “alarmingly insensitive,” stating, the city would “bulldoze rather than rehabilitate.” Summing it up with, “the business community is accused of paying lip service to history while planning to demolish it.” Ada’s sentiments echo in the aftermath of the PEM’s latest announcement. 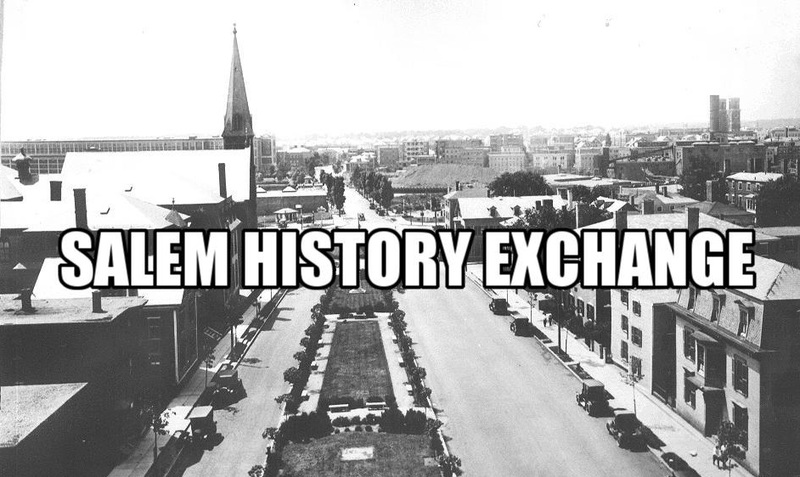 Has the PEM been "paying lip service to history" while planning to demolish it all along? Is this Salem’s latest battle against Urban Renewal? And if so, is there an Ada Louise Huxtable that can save the city? 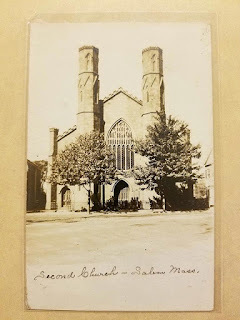 The recent proposal by the Peabody Essex Museum shows the Museum’s complete disconnect with the Salem community, and the rich history they are the stewards of. The Museum has lost the trust of its patrons, many of which in recent days have resigned their memberships, stood united in protest, contacted their state representatives, and signed a petition aimed at keeping the archives in Salem. The collective disappointment weighs heavily throughout the city and is the primary topic of conversation. If a compromise isn’t found, Salem, a city synonymous with history, will be forced to mourn its loss. 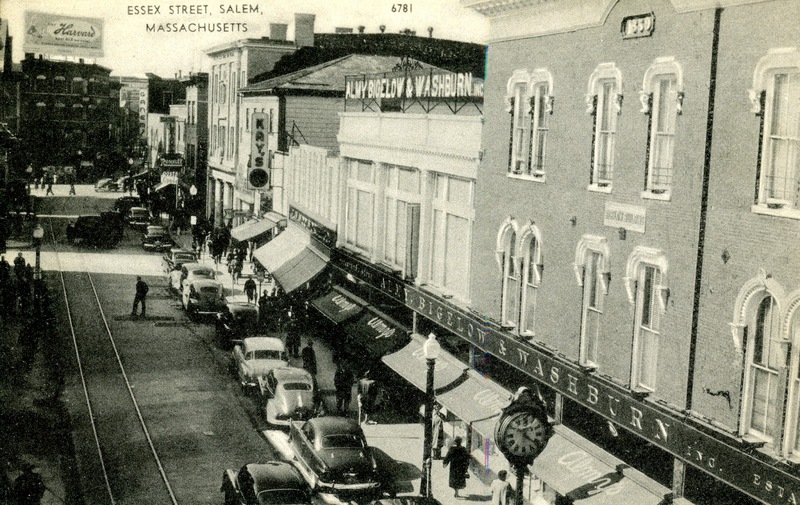 Salem’s beloved department store Almy’s can be traced back to 1858, when James F. Almy opened his first store at 156 Essex Street in the Bowker Block. 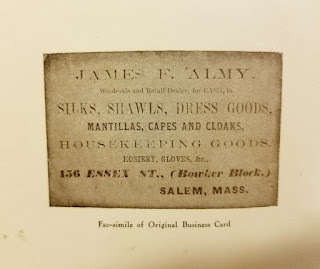 His original business card read “James F. Almy, wholesale and retail dealer for cash in silks, shawls, dress goods, and housekeeping goods.” After a successful first few years in business, Almy moved to a larger space in the West Block at 188 Essex Street, where the store remained. 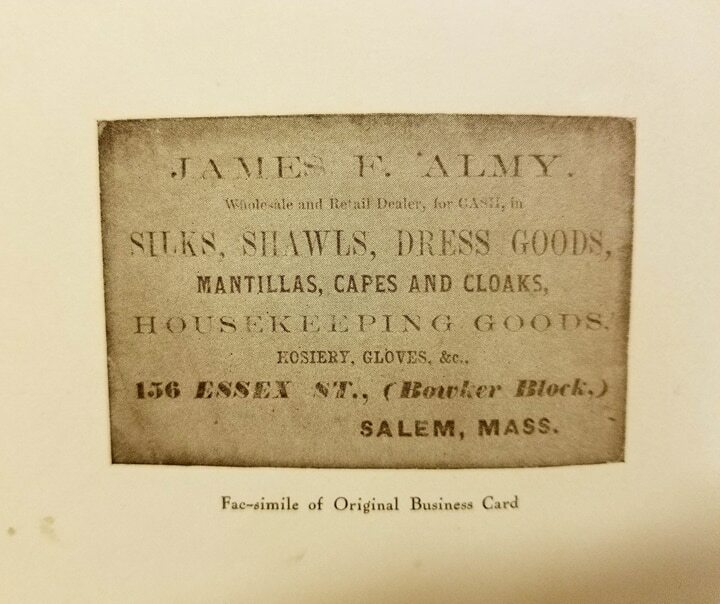 Copy of James F. Almy's first business card for his 156 Essex Street location. 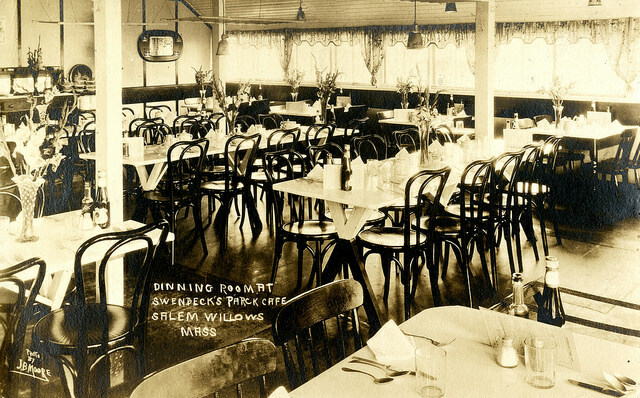 In the 1860s, Walter K. Bigelow became Almy’s business partner and the firm changed its name to James F. Almy & Co. 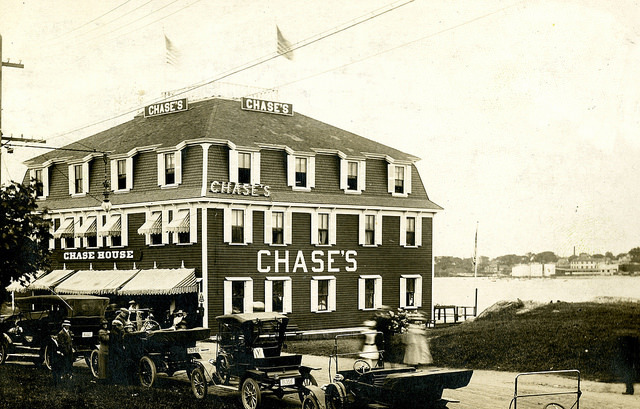 The store continued expanding and around 1869, William G. Webber also became a partner. The firm was renamed Almy, Bigelow & Webber, which it remained until Webber’s retirement in 1885. After Webber’s departure, Calvin R. Annable and E. Augustus Washburn advanced to partnership with Almy. The firm then changed to its final name of Almy, Bigelow & Washburn. 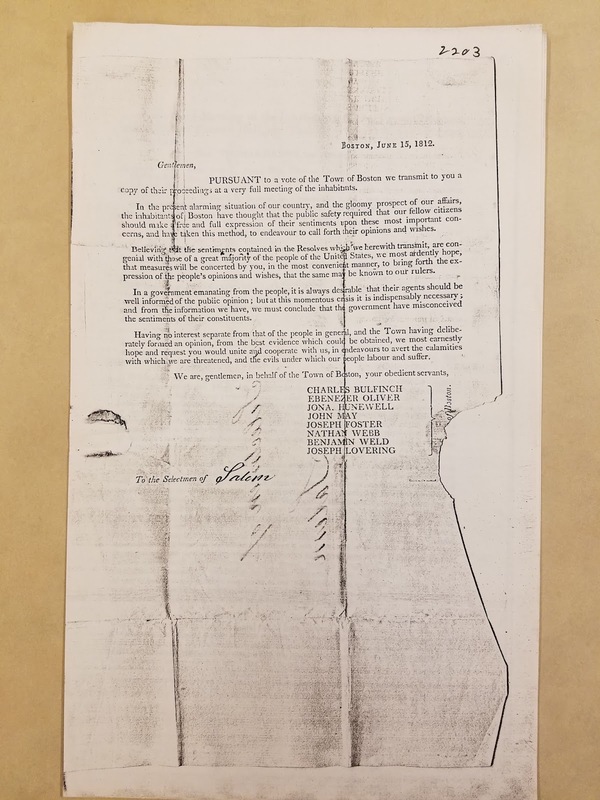 The business was incorporated after the death of James F. Almy in April 1899, with Almy’s wife and daughter serving on the board. 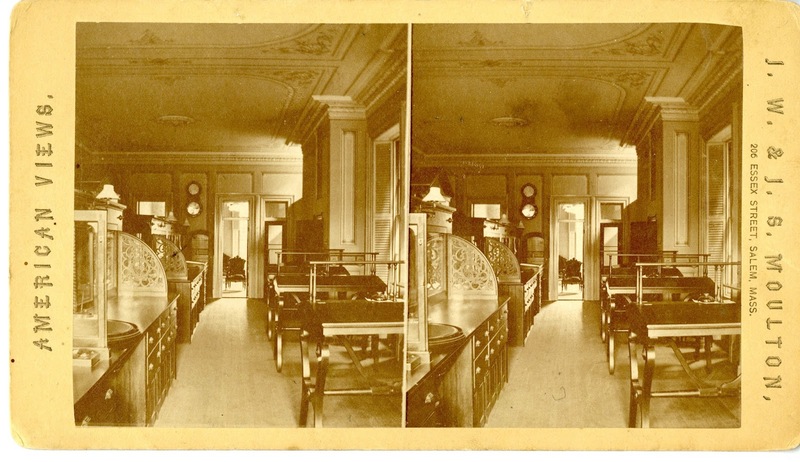 Early 20th century postcards showing Almy, Bigelow & Washburn's store at 188 Essex Street. 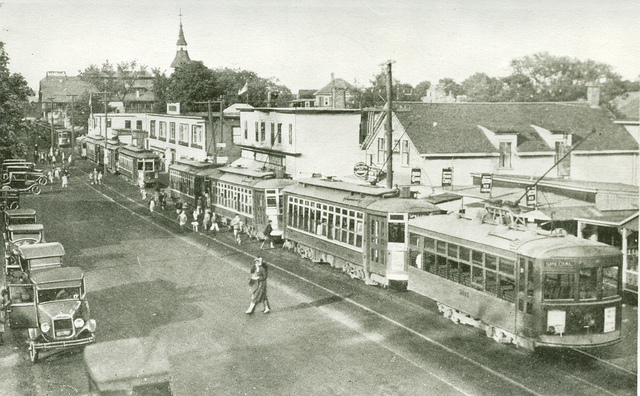 In the first half of the 20th century, small branches of the store were added in nearby towns such as Beverly, Danvers, and Gloucester. 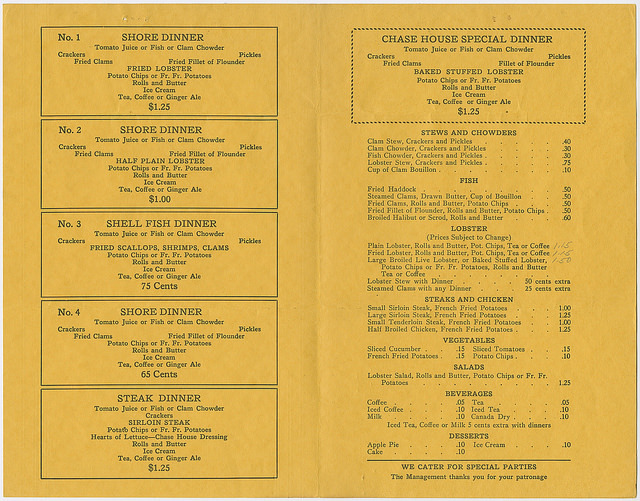 In 1951, Almy, Bigelow & Washburn Inc. was sold to the Gorin family, which already operated a small chain of stores. By the 1980s, the Gorins owned 32 stores throughout the northeast, many of which they rebranded as “Almy’s.” After several years of struggling to make a profit, the Gorins sold their company to an investment firm. By 1985, a majority of the Almy’s stores had been sold to Stop & Shop Companies for redevelopment. Today all that remains of Salem’s Almy’s is a clock that bears its name on Essex Street. The Salem Chamber of Commerce introduced Haunted Happenings in 1982 as a weekend-long Halloween celebration with events throughout the city. The weekend included a Horribles Parade, with costumes judged by Laurie Cabot, and a witches brew contest at Victoria Station. 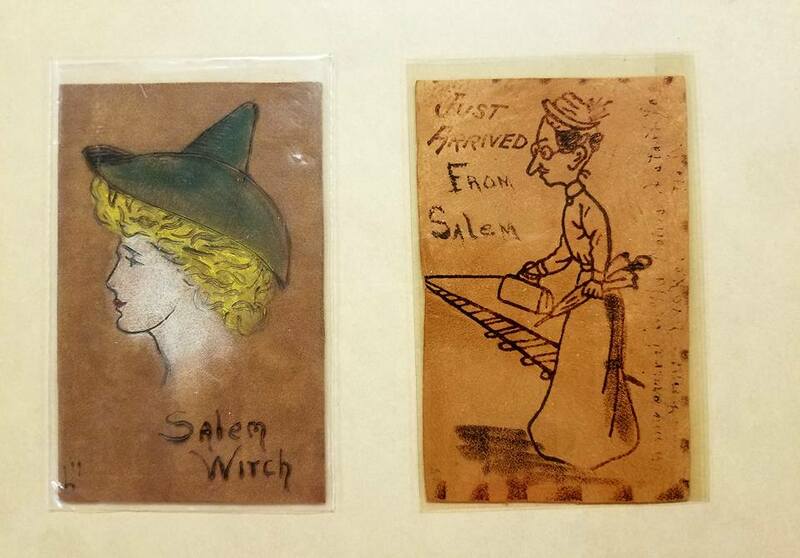 Coinciding with Haunted Happenings, The Essex Institute hosted an exhibit “Salem Witches, Documents of an Early American Drama”, which focused on the Salem Witch Trials. The first year was a success and the series continued to gain momentum each year, adding new attractions and partnering with more businesses and organizations across the city. 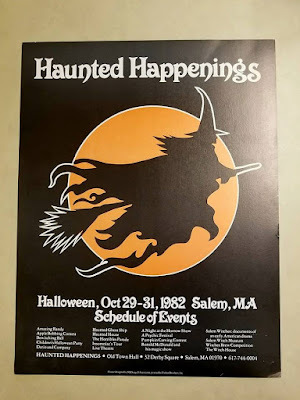 In the 1990s, Haunted Happenings marketing was increased with hope that Salem’s tourism could expand into fall, a usually quiet time in the waterfront community. 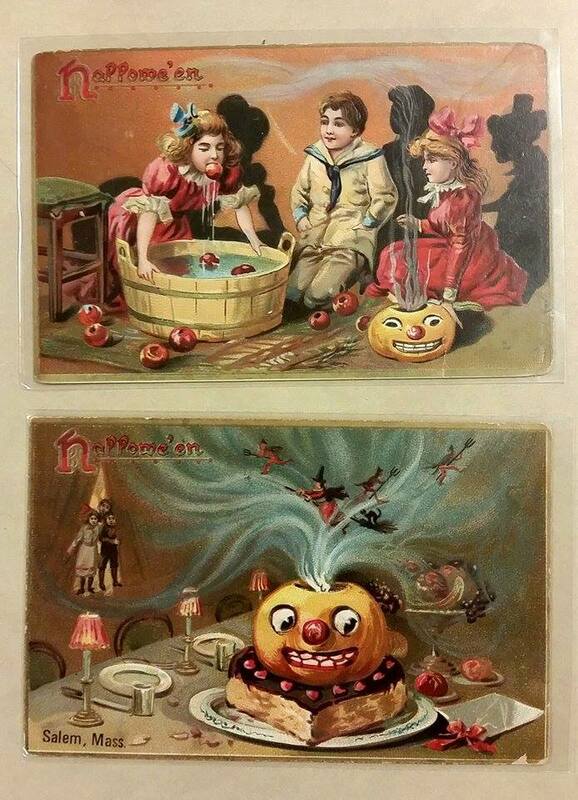 By the end of the decade, Haunted Happenings had grown from a weekend celebration to one spanning ten days. 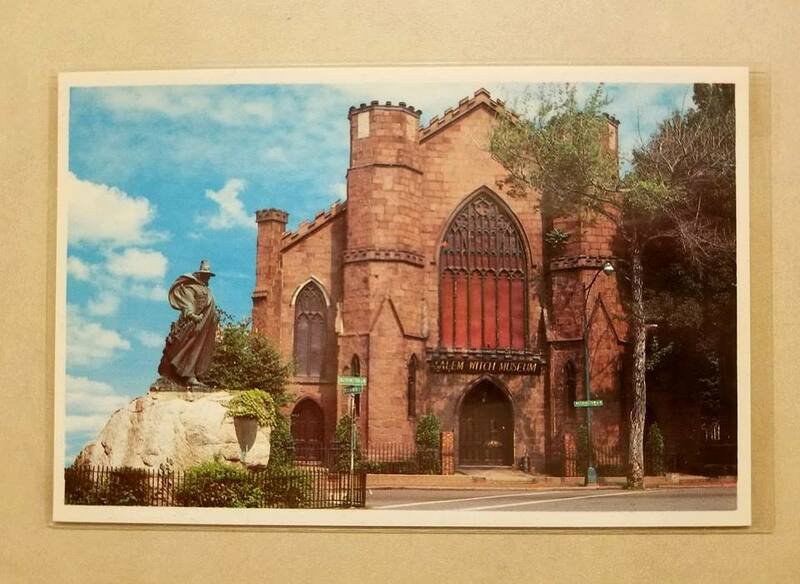 In 1992, the tercentenary of the Witch Trials brought an international spotlight to the City with the dedication of the Salem Witch Trials Memorial. News coverage created a renewed interest in Salem’s history and attractions. 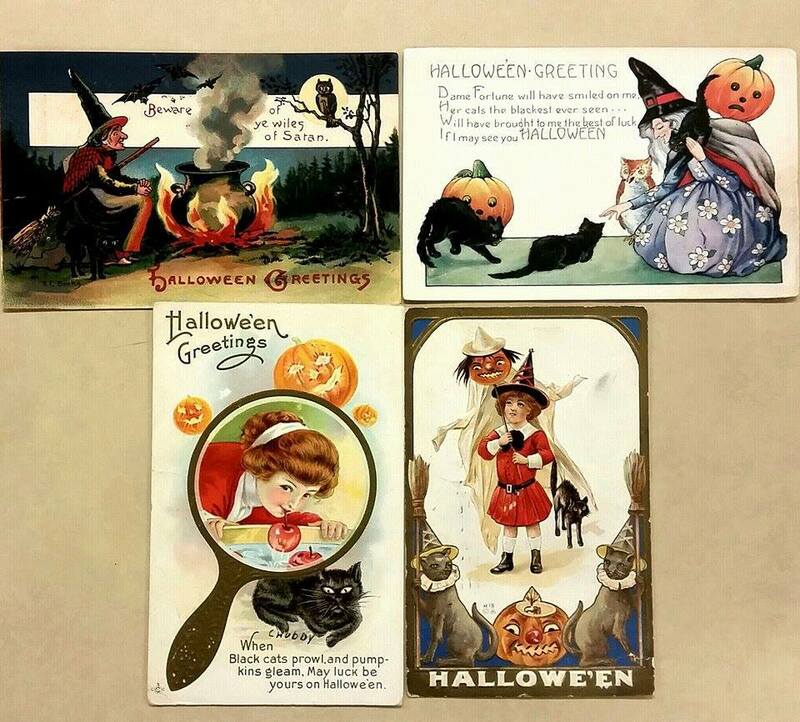 The first Halloween parade was held in 1995, beginning modestly with costumed school children. The parade signified the city’s transition to family-friendly Halloween events and activities.The parade now acts as the official kick-off of October's festivities. 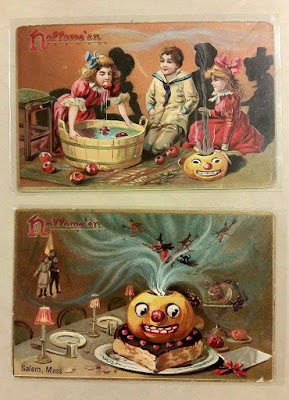 Haunted Happenings now draws approximately 400,000 people annually to Salem. In 2007, the grand fireworks finale was added to mark the end of the month long celebration. The Asiatic Building was initially built for the Asiatic Bank in 1855, when it moved from a smaller location in the East India Marine Building (now part of the Peabody Essex Museum). 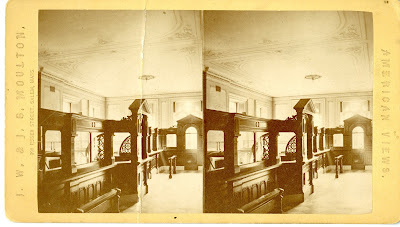 The building was designed by William H. Emmerton and Joseph C. Foster and was built partially on land originally belonging to the First Church and the Higginson Family. The Asiatic Building housed multiple banks and financial institutions and was nicknamed “The Bank Block.” Residents included: Naumkeag National Bank, Merchants Bank, Salem Marine Insurance Company, and most notably The Salem Savings Bank. 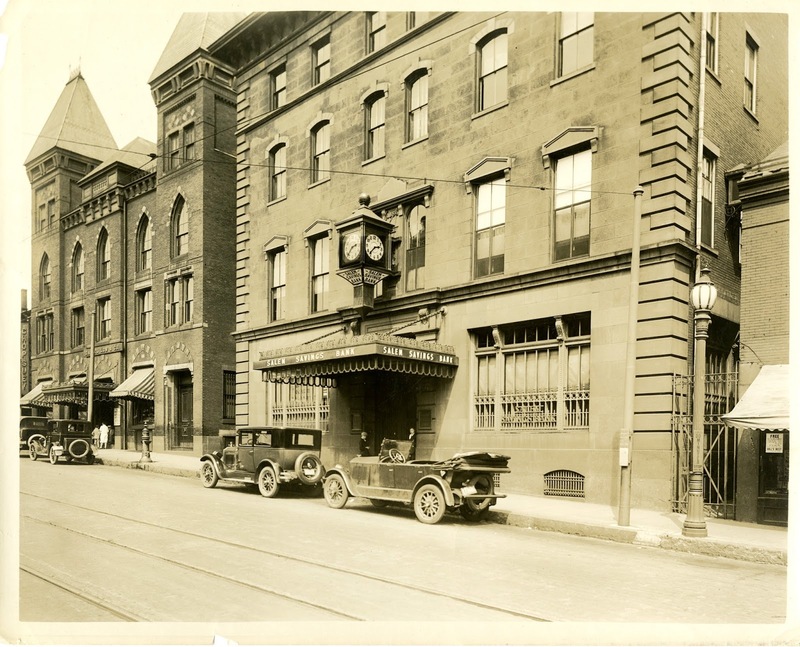 The Odd Fellows Hall was also located on the top floor, and their name adorned the facade of the building. Around 1855, Washington Street was renumbered; 125 Washington Street until this time was 28 Washington Street. 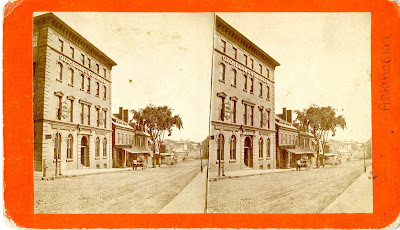 In the 1851 Salem Atlas, a structure appears where 125 Washington Street now stands and in the 1853 Salem Directory it is listed as being the home of Joseph Gardner, Jr. a carpenter. 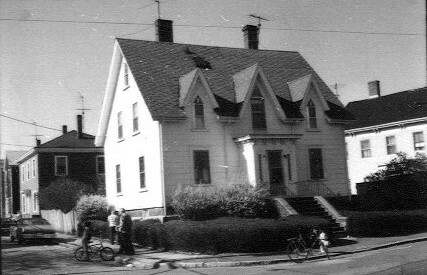 125 Washington Street was remodeled in the early 20th century by architect Arthur E. French in the Colonial Revival style. The remodel included the removal of the top floor and the construction of a new façade. 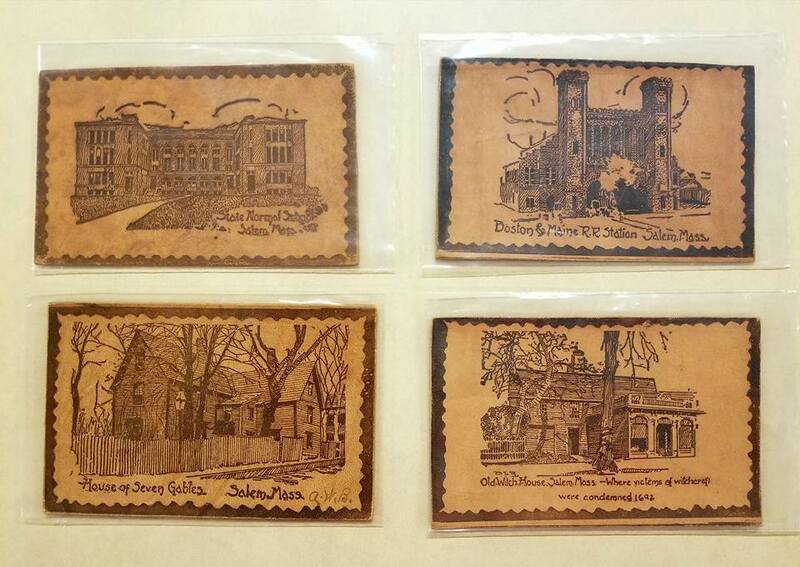 In 1971, Mayor of Salem Samuel E. Zoll proclaimed Saturday, May 1st to be “Hello Day.” The event was one in a series of month-long initiatives to celebrate the inauguration of new Salem State College president, Frank Keegan. 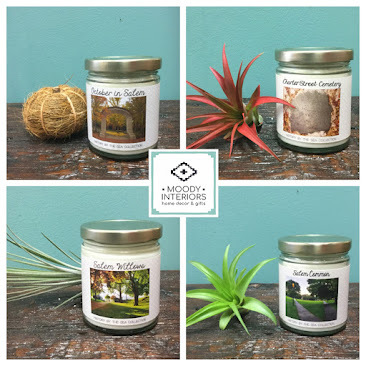 The event was conceived by artist Donald Burgy of Bradford Junior College with the intention to revive kindness in Salem and help acquaint citizens with their fellow neighbors. Zoll and Burgy saw a wane in neighborliness with the rise of mass media and automobile travel and hoped “Hello Day” would better unite the community and possibly spawn future events. The two also requested that photographers capture the occasion and submit their images for multiple displays around town. "Hello Day" celebrations on Salem Common. Keegan and Zoll, seated, being interviewed by news outlets on Salem Common. "Hello Day" celebrators gather on Salem Common for an interview with Channel 5 news. 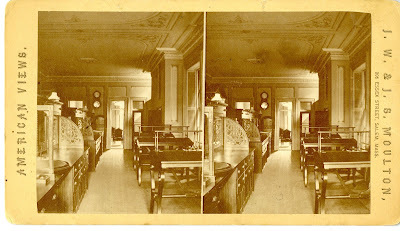 Keegan and Zoll can be seen, seated. A group of kids gathered on Salem Common for "Hello Day." Pedestrians wave hello to each other in celebration of "Hello Day" on Essex Street.